Efficiency: Packed column distillation apparatus have up to 45 theoretical plates at atmospheric pressure. Packed distillation columns can be stacked for even higher efficiencies. Scalable: Packed column distillation systems can be scaled up from small laboratory units up to much larger industrial sizes. B/R produces packed columns with up to 2000 liter boiler capacities. High Throughput: Packed column distillation can produce high distillation rates. Our largest packed distillation column can distill over 100 liters per hour. All distillations attempt to separate a lower boiling material (A) from a higher boiling material (B). 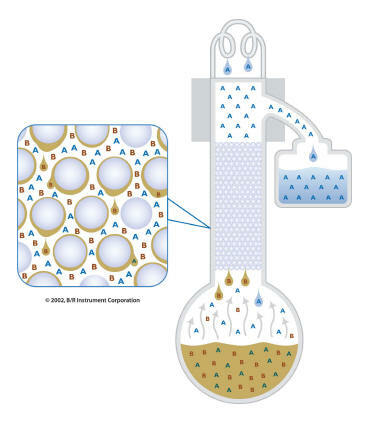 Packed columns are "packed" with a material that creates a large surface area within the distillation column. Vapors rise through the column, are condensed by the condenser and fall back down the column. This material is called the condensate. The descending condensate "wets" the packing. Ascending vapors rise through the wet packing and are forced into intimate contact with the condensate. This intimate contact causes the vapor to become enriched in the lower boiling material. This process is often called rectification.